Before the Ottoman Empire was founded in 1299, most of Asia Minor was ruled by the Turko-Persian Anatolian Seljuk State, also known as the Sultanate of Rum. In it's short 230 year history, the Sultanate established a dynamic multiethnic, multicultural society. Seljuk architecture became renown for its caravanserais, mosques, medreses and bridges. 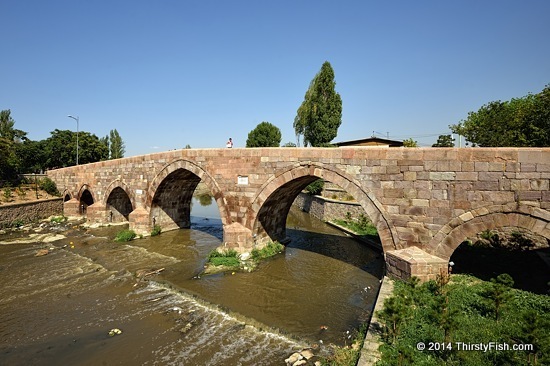 Akkopru, literally the "white bridge", located in Ankara, was commissioned by the Seljuk Sultan Alaaddin Kayqubad I and built in 1222. It is still used for pedestrian crossing. Seljuks had strong trade ties with the Genoese and they facilitated the flow of goods from Iran and Central Asia to seaports with a network of such bridges and caravanserais established on trade routes.